Families with kids make up many of the millions of Washington, DC annual visitors. DC is a family-friendly destination but it’s not Disney World or a place specifically designed around fun for kids. In this episode of the Trip Hacks DC Podcast, Rob is joined by Austin Graff to talk about visiting Washington, DC with kids. Austin is one of the only dad bloggers in the city. He loves exploring “off the beaten path” Washington, D.C. with his 2-year-old daughter and wife. And you can follow his adventures on Instagram at @austinkgraff and at @dcurbandad and on his DC Urban Dad blog. When you think about things to do in Washington, DC with kids, there are a few obvious places that come to mind. If you google “things to do in Washington, DC with kids” you are bound to come across the National Zoo and the Smithsonian’s Natural History and Air & Space museums. Austin admits that he is not the biggest zoo fan but that it is still a popular destination for families. In addition to he main animal exhibits he recommends the “house” exhibits like the Reptile House and Small Mammal House. Austin also notes that the National Zoo has excellent programming and you should check out the Daily Events calendar to see what’s happening on the dates you are in town. Museums in DC are family-friendly but some of the best exhibits for kids might not be the ones you expect. While most visitors think about museums in terms of the exhibits, Austin’s family thinks about them in terms of spaces. The best museums, he says, are the ones with bigger spaces where kids can explore. He likes the National Gallery of Art, the National Building Museum and the National Portrait Gallery. He talks about the Kogod Courtyard which is a great place to let kids expend some energy. 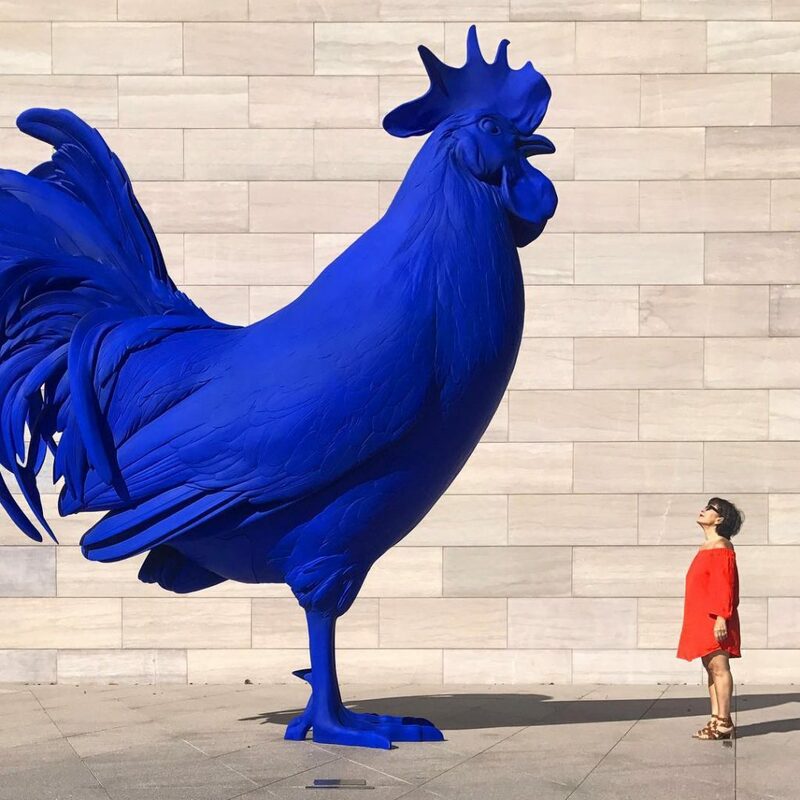 The Blue Rooster is a popular photo spot at the National Gallery of Art. Photo credit: Austin Graff. For families traveling around the city, Austin recommends a light compact stroller that folds up while not is use. On Metro unfolded strollers are only allowed in elevators, not escalators. Austin’s trip hack is to bring a fordable umbrella. After you get off the train, the child stand with their parent on the escalator, which saves time and hassle. He also says that you can call Uber and Lyft cars with a pre-installed car seats, but they are limited and often expensive. If you need to use Uber and Lyft a lot during the trip it might be worth brining a travel car seat to bring with you. Since becoming a dad, Austin describes how his family has shifted from taking out-of-town vacations to taking in-town “staycations”. In the past couple years they’ve stayed at the Graham Hotel in Georgetown and the Darcy Hotel downtown. During their staycations, they focus on a single neighborhood and really explore what the area has to offer. One of the benefits of picking a hotel within walking distance of the things you most want to see is that you can pop back anytime for a rest or for the kids to have a nap. If you’re staying far away that’s not possible. One challenge that many families face is finding things to do after the museums and main sites close around 5pm or 6pm. Austin mentions that a few museums stay open late-year like the Building Museum, Portrait Gallery and American Art Museum. Some museums have extended hours during the summer as well. Make sure to check out the Smithsonian hours website for details. 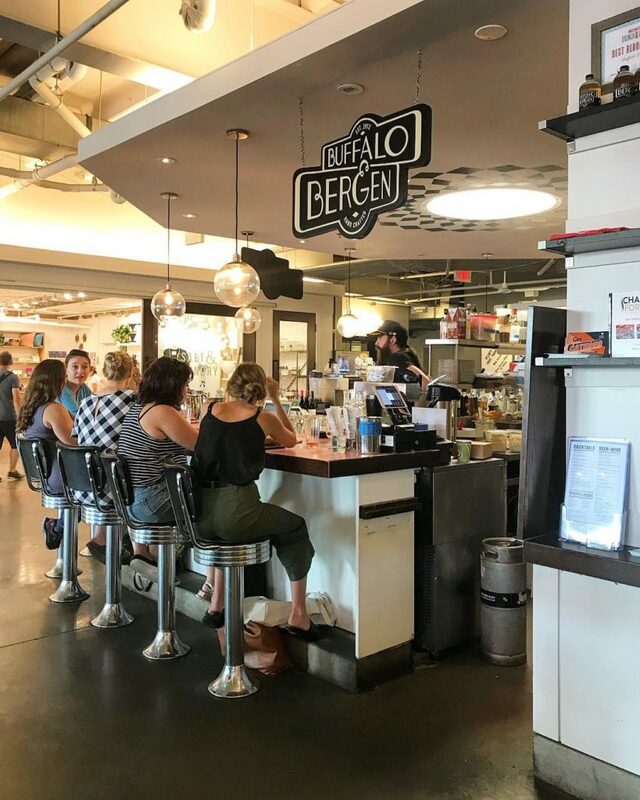 Union Market is a popular food hall that’s open late and kid-friendly; as is Union Station, the historic train station that has stores, restaurants and cafes. In the summer, you can check out a “splash pad” and in the winter you can go ice skating at the ice rinks around town. Not mentioned in the podcast but worth noting that if you’re a sports fan many baseball, basketball, soccer and hockey games start at 7pm on weekdays. Union Market is a great option for families looking for a fun evening activity. Photo credit: Austin Graff. When it comes to picking restaurants and places to eat, Austin’s rule of thumb is to skip any restaurant that has candles on the tables. DC has some of the best “fast casual” restaurants in America. A few of Austin’s favorites are Cava Grill and TaKorean. Check out our post on how to get free food credit at many of them. Beer gardens are also a surprisingly family-friendly place to grab food and drinks. The Brig is a beer garden that specifically advertises itself as kid-friendly and dog-friendly. Austin and Rob both highly recommend checking out an Ethiopian restaurant when you’re in DC. Austin’s favorite is Ethiopic on H Street NE.